Got Jack Russell Terrier Questions? Get Your Complete JRT Training Guide Today! This is the one-stop info centre for Jack Russell Terrier (JRT) lovers. JR Terriers are famous for their great personalities and abundance of energy, which means they are both great pets and great working dogs. Our JRTs bring joy to our lives, but we all know there are times when these independent characters can turn into little devils. The digging, the barking, the snarling, the chewing - I've seen it all and learned how to deal with it, and now I'm passing it on to you. And that's why this site is here - to help you deal with any problems you come across with your pet and answer your questions. I'm constantly updating the site, aiming to make this a complete JRT information resource and the best JRT site on the net, so be sure to check back regularly for updates. Better yet, click on the orange RSS button on the left to be notified automatically whenever the site is updated! Whether you are a new proud owner of a JRT, planning on buying a puppy, looking to breed your own pups, looking for training info for a young dog, a long-time owner searching for some interesting facts and pictures, or trying to find a dog to adopt, you'll find everything you need to know right here. and a whole lot more, including history, pet security and keeping your dog healthy. Oh, and by the way - it's FREE. JR Terrier owners are quite often obsessed with their pets. I have to admit I'm no exception. As a JRT enthusiast it can sometimes be hard to find information specific to our dogs. They are high energy, affectionate dogs and they require a great deal of attention and exercise. Understanding why JRTs are the way they are helps to increase the enjoyment of the life experiences we share with our animals. And after all, that's the ultimate point of pet ownership - enriching both your life and your pet's life through the experiences you share. All the information on this site will help to ensure your dog has a long and happy life. I have found JRTs to be among the most life-enriching animals that exist (and being a wildlife park guide, I've had experiences with many, many animals of all shapes and sizes.) 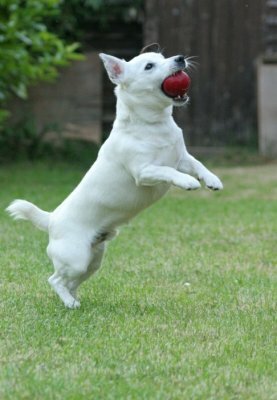 JRTs are extremely unique, so they need a site to themselves that provides specific information for their care, training and handling. I've personally experienced buying, breeding, delivering, hand-feeding, training and owning JRTs. This site is created by a dedicated and experienced JRT lover just like you. 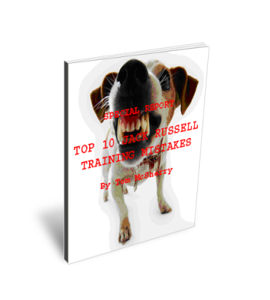 This 9 page ebook outlines ten biggest mistakes that virtually every JRT owner makes when training their dog. By downloading and reading your free copy you'll immediately know exactly what to avoid when training to help you get a better-behaved dog, faster. My E-Zine, Jack Russell Crazy delivers answers to readers' questions about JRTs straight to your inbox, as well as keeping you up to date on new additions to the site and previews of upcoming content. It's all completely free. Go ahead and sign up today! This free 7 day Jack Russell training course is the first step towards creating better behavior in your dog. 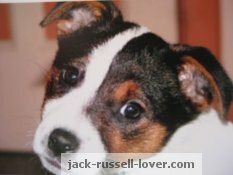 The Jack Russell Lover Blog keeps you informed and up-to-date when new information is added to this site. Subscribe to the blog to keep your finger on the pulse. Homemade, healthy dog food recipes can improve your dog's health, quality of life and longevity! Visitor Jack Russell Terrier Photos - Submit Your Own Jack Russell Photos! The story of how I became a Jack Russell owner is very emotional for me. If you enjoy Jack-Russell-Lover.com, I'd love to hear from you. Use this page to contact me. Jack Russell puppies are a whole lot of fun, but they can also be a huge challenge. These tips on buying, training, feeding and raising your puppies will help you through the process. Raising Jack Russell Terrier puppies is one of the most exciting experiences you can have, but it is also fraught with danger and difficulty. The information here will help you avoid the pitfalls. Because of their high-intensity nature, many Jack Russells end up being abandoned by unprepared owners. Jack Russell Rescue, Inc. Most adult Jack Russell dogs are crazy little balls of power and energy. They have a reputation for being out of control, but this is not always the case. Jack Russell training can be fun for both you and the dog - if you know what you're doing. If you don't, it could be a drawn out and frustrating experience. Finding Jack Russell breeders with solid reputations is the first step on your puppy search, whether you're looking for a pet, a worker, or a show dog. Jack Russell Terrier care is the most important aspect of owning a JRT. This page provides all the information you need to keep your dog in good condition and keep an eye out for warning signs. There are lots of different puppy games - games to play with your puppy for training and fun, and virtual games about puppies for your own entertainment. There are lots of cool dog tricks to teach your dog, and many of them are easy - all you need is a bag of treats, some space to work, and your dog. All the best Jack Russell Terrier pictures are here. Check out the galleries here for pictures of Jack Russell puppies and adult Jack Russells in action. New Jack Russell Pics of my three terriers, Bella, Runty and Louis. Runty and Louis are brother puppies from a litter of ten. This is a table of contents for the entire Jack-Russell-Lover.com site. You can use the Jack Russell Terrier links page to find more information and resources for different aspects of dog ownership. The Irish Jack Russell is a strain of Jack Russell Terrier that has been bred to emphasize shorter legs and a calm temperament. Looking for the best easy dog tricks to teach to your pet? Check out this list of the easiest dog tricks, with simple, easy-to-follow instructions for how to teach them to your dog. Dog rehoming is not something that should be undertaken without careful consideration. There are many questions to ask yourself before you offer your dog up for sale or adoption. Training terriers presents a special kind of challenge for dog owners. Because of the nature of terriers as earth-working dogs, you need to take a very specific approach to training. The number of Jack Russell Terrier mix breeds is growing all the time as purebreds are crossed in new combinations. Find out about some of the popular and lesser-known mixes. Good Jack Russell Terrier names are hard to decide on. Do you go with a classic name, or try to come up with something original? There are many famous Jack Russells of both the big and small screens. Because of their intelligence, trainability and cuteness, they've become a popular breed of choice for movies and TV. Housebreaking Jack Russell Terriers is known to be a difficult process, but a few simple tips and techniques can help make the transition a lot smoother when you bring a new dog into your home. This guide to Jack Russell behaviour aims to explain in a quick and simple way all the most common behaviours seen in a Jack Russell Terrier - and what causes them. Jack Russell barking can be a big problem for you and anyone who has to live nearby. Barking is something Jack Russells naturally like to do - it's self-rewarding for a lot of dogs. A Jack Russell Pet - Can You Handle It? A Jack Russell pet is a huge responsibility - small and cute, many potential dog owners find the look of these dogs appealing. But there's more to a Jack Russell than meets the eye. This Jack Russell Terrier Info has been put together to answer the questions of the typical person in the market for a pet who becomes curious about Jack Russells. When you bring home a new Jack Russell pup, it's usually tempting to spend all your time playing and adoring the little creature without much thought to training. When it comes to training Jack Russells, the majority of owners struggle. Jack Russell training is usually a battle of wills. I'm Tom McSherry. I wrote <b>The Jack Russell Lover’s Ultimate Guide to Training</b> after coming up against frustration time and time again as a JRT owner. Please give Christchurch earthquake help by donating generously. As many of you know, I live in Christchurch, New Zealand, which was devastated by a large earthquake yesterday afternoon. AKC Jack Russell Terriers: Why are JRTs excluded? Jack Russell Terrier Pet Insurance: Is it Right For Your Pooch? Is buying Jack Russell Terrier Pet Insurance the responsible and fiscally sound thing to do?